We traveled back to Disco for American Idol’s Top 7 Part 2. “Last week” Matt Giraud got the first-ever “save” so this week they had to lose 2 contestants. This is the best performance video I could find that contains the judges’ remarks. As a little bonus, maybe you’ll pick up some Brasilian?! And here it is with gorgeous Isolated Vocal . Top 7 Ford Commercial – for some reason, this video couldn’t be embedded, so you’ll have to click here to watch it. 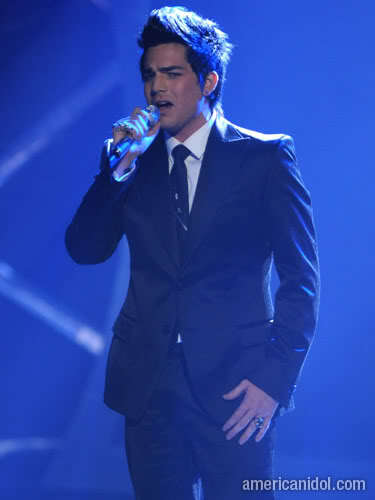 Adam used this Confessional to talk about his artistry and his first album. Here’s a little thank-you to the fans from the Idols, where Adam mentions us! This was actually in last week’s Top 7 show, but didn’t make it into the article. This week, they said goodbye to Anoop Desai and Lil Rounds. Stay tuned for next week’s Rat Pack Standards! HI! This is your all loving mom; I send you all everything best from Bia?a Podlaska; How are you all my wonderful children? I miss you sometimes honies. I would like to see you someday or your kids , my grandchildren, maybe I will and will not die. It has been so long since I last saw you. Write me something sometimes or you may send me some pictures or show something on you tube. Many kisses to you all. Bye! Your always mother. Great videos Carol. Thanks for all the memories!